I’ve got a treat for you today, and it has to do with this gorgeous JORD watch below. Are you looking for a watch but can’t decide on which one to choose? I’ve been there one too many times. With all of the unique options available at JORD Wood Watches, I had SUCH a hard time picking out my favorite style. Do I go with something more flashy, minimal, modern or a little more classic? I narrowed it down to two of my absolute favorites; the Cassia – Walnut & Vintage Rose and Cassia – Ebony & Sable. It was a tough decision but I decided to go with Ebony & Sable since I can wear it with just about anything. I was super happy about my decision when it showed up on my doorstep — isn’t it incredibly classy?? Watches are an extension of my personal style and I just love JORD Wooden Watches because it’s unique and distinctive, yet classic and elegant to the core. I opted for the Cassia because it felt like such an elegant and ladylike watch for everyday use. This is a timeless piece that I’ll be able to wear for a long time. I love the black and ebony combo with the gold hands and crown. 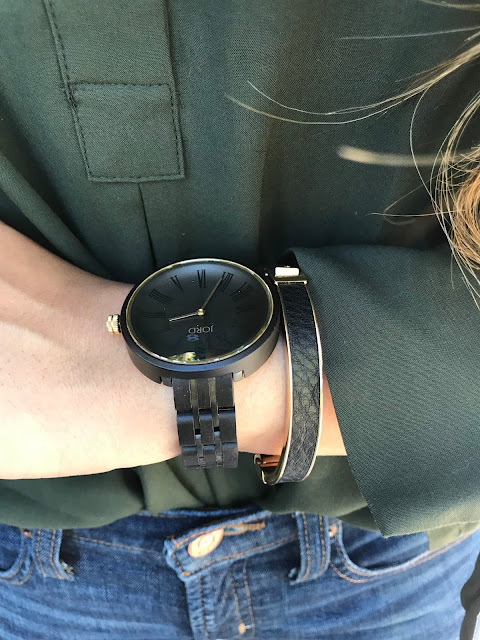 The watch face is a little on the larger side – something that reminds me a lot of the watches my best friend wears – and the ebony wood strap fits nicely on my small wrist. 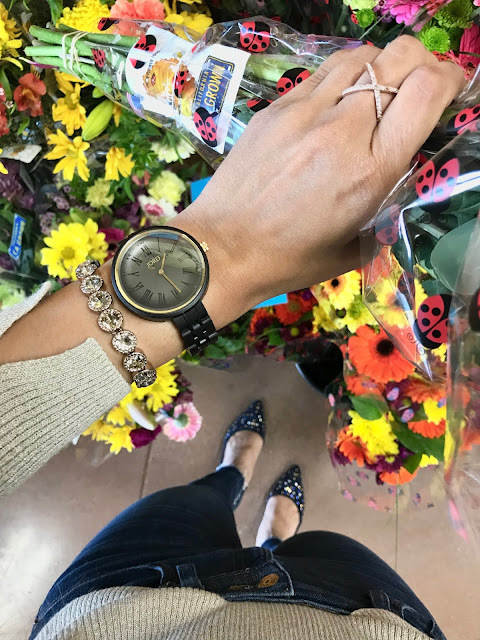 I never envisioned myself wearing all black watch but the sleek look paired with gold jewelry is a stunning combo! The Cassia collection is featured as one of the smartest wood watch design from the JORD wood watch series. It’s the perfect pairing to any outfit in your wardrobe, from skinny jeans and a knotted tee to a fringe dress. The Cassia collection comes in four stunning colorways that feature beautifully grain woods and muted dials. I think it goes without saying that the quality is impeccable and the details to this collection have been well considered. One of the things that really sets this watch apart from all other watches is the distinct branding. The design of the Cassia speaks for itself – innovative, clean and unique. It’s only natural that this watch has become a fast favorite and part of my everyday uniform (and at this price, why wouldn’t it be?!). So without gushing too much, it’s just one of those uniquely elegant and high-quality classics that I will wear for years to come. I am happy to announce that I have partnered with JORD Wooden Watches to gift one lucky winner $100 credit to use towards any watch of their choice. AND EVERY participant who enters the giveaway will receive 10% off. Literally, everyone is a winner! To enter this giveaway, just use the link below. The giveaway will close on Sunday, February 11th, 11:59pm. Good Luck!! Psstt, if you want to go ahead and order one for yourself or that special someone, I say go for it!! You can order one, or two here.